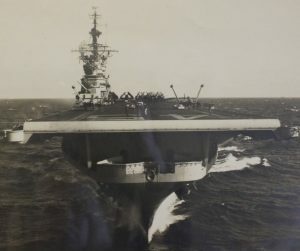 Onboard USS Valley Forge at the start of the war. James Pride grew up in Florida but often moved around the south to Alabama and Georgia. Like many of his generation, he grew up during the Great Depression and WWII. As a young man, he worked various part-time jobs to earn an income to help support his family. 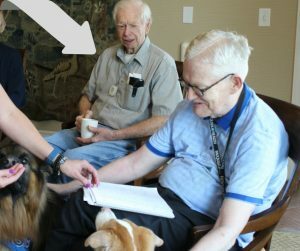 James enjoys the friendly pet visits from Hero’s Bridge Paw Patrol members during the monthly veterans social. During his youth he saw ships attacked by German submarines off-shore in Florida and vividly remembered the day Pearl Harbor was attacked — he was just 10 years old at the time. He and his best friend and classmate enlisted together. But when they reported for duty, James was sent to San Diego, while his friend trained with Marines at a different location. Photo of USS Essex, courtesy of James Pride. 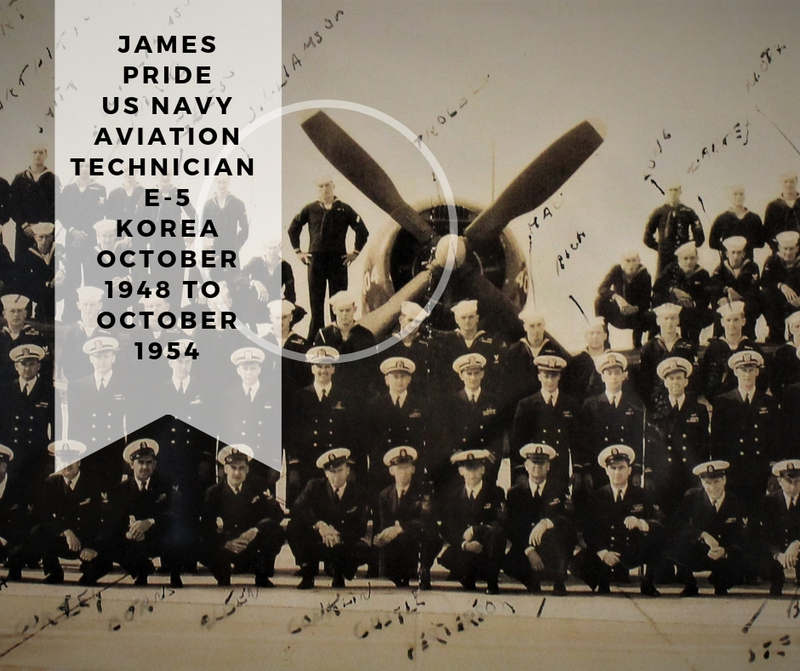 During the Korean War James served as an Aviation Technician E-5. While he was deployed he served on USS Valley Forge (CV-45) and USS Essex (CV-9). He supported the first combat strikes in Korea by the US Navy in July 1951 and saw continuous action for the next five months from the Pusan beachhead to the amphibious assault at Inchon. Before the war officially began, James was onboard an aircraft carrier off the coast of Korea; it was the only carrier in the region. Their mission was to pick up planes still in Okinawa left from WWII and were doing this just days before the war began. James also shared that many of his shipmates were on leave for several days when this announcement was made. The sailors who were on leave were left behind, to be picked up by destroyers and then brought back to their ship in Subic Bay, where the destroyer met the carrier. “The Marines went into Inchon, where one of the first group of KIAs (killed in action) was my buddy who enlisted with me,” James shared. He felt that MacArthur’s orders for the invasion, battle, and troops really helped in the war effort. 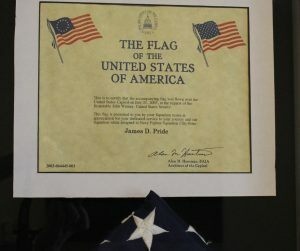 Recognition provided to James hangs on his wall along with a flag. During his active military career James was awarded the Navy Occupation Service Medal “Asia”, Korean Service Medal (3) stars, United Nations Service Medal, and Navy Unit Commendation Ribbon (USS Essex) and Carrier Air, Group 5. James civilian career had him work for several prominent businesses: Lockheed Martin to IBM. He travelled around the US living in Georgia, Cape Canaveral, Vermont and Virginia. During the time he worked for IBM, James purchased a farm in Warrenton and has lived in the area since. James always wanted to be in the Navy and after completing his enlistment, he continued his education and went to electronics school where he learned about sonar, radar, and electronic communications. 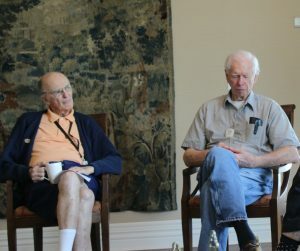 Monthly veteran socials keeps WWII and Korean veterans engaged in VA issues and camaraderie. James later returned to Georgia and pursued academic classes at Georgia Tech. “This education help me to get the jobs I wanted,” he said. James continues to serve as life member of the Veterans of Foreign Wars (VFW) and is active with his local VFW Post 9835.